One shiny, sparkling documentary among the new movies opening in theaters this weekend. And the rest are, for the most part, dogs. Sorry for my late reviews. But, you can always hear my movie reviews live, first thing every Friday morning on “The Mike Church Show” on SiriusXM Patriot Channel 125 after 7:05 a.m. Eastern, on “The Pat Campbell Show” on KFAQ 1170 AM Tulsa at 7:35 a.m. Eastern, and on “The James Show,” on KWTX 1230 AM at 8:30 a.m. Eastern. I do my movie reviews on all three shows, as well as some discussion of current political issues and pop culture topics. The story: Duane “The Rock” Johnson is a jack of all trades and a MacGyver of sorts. He’s a first responder, whose wife is divorcing him. The wife (Carla Gugino) and his daughter have moved into a billionaire’s mansion. 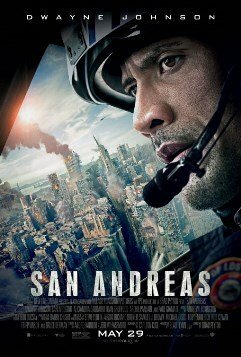 But, soon, a massive earthquake hits San Francisco and an expert (Paul Giamatti) predicts that it will strike the entire San Andreas Fault with a magnitude and force unlike that which has ever struck the earth. Giamatti has created a computer model that can predict where and when earthquakes will strike, and after seeing the Hoover Dam fall to the initial earthquake, he warns everyone to get out of San Francisco. Soon, the first of the earthquakes hits San Francisco, and Johnson’s daughter is trapped in a car in the basement of her mother’s billionaire boyfriend’s building. The boyfriend is a coward and flees, leaving the daughter in the trapped car, where she will die if not rescued. A guy who was interviewing for a job and had met the daughter as he was waiting for his appointment, sees the billionaire telling a guard where the girl is. So, he and his little brother find her and rescue her. Then, together, they flee and try to reach her father, Johnson. Ultimately, they get in touch and plan to meet at a higher point of land somewhere near San Francisco. In the meantime, Johnson has rescued his estranged wife from the top of a skyscraper. The movie is filled with disasters, from none of which a normal person would ever live or be rescued. But in this movie, it’s situation after situation like that, and the daughter gets rescued. I saw this in 3D, and even though the 3D effects were decent in this, you’ll be fine staying with 2D and without shelling out extra. Like I said, there’s nothing you can believe in this movie. Not even remotely. There is not suspending disbelief for even a second. But it’s definitely non-stop, entertaining action, and you won’t be bored at all. It’s like the movie, “Earthquake,” with a faster pace and much better special effects. That said, I could have done without the Oprahfied segment of the movie in which Johnson starts crying and apologizing to the wife over how their relationship broke down after the death of their other daughter. PUH-LEEZE. And right in the middle of a catastrophe, in which there’s not time for that. I wanted to slap him and shout, “MAN UP!” The same for multiple other scenes like this between Johnson and Gugino and between the daughter and the guy who rescues her. Um, there’s no time for that when your life is in danger from massive earthquakes. * “Aloha“: I was not invited to screen this movie, and it wasn’t promoted (or even represented, I believe) by the normal studio representatives for most other big feature films. But I went and saw it on my own. Big mistake. The word, “Aloha,” can be used as a greeting of hello. But it can also be used to say good-bye, which you’d be best advised to do. It’s just awful. The movie is a long, boring, disjointed, nonsensical slog containing multiple, stupid, uninteresting stories. Stone is half Asian and a quarter Hawaiian (funny, she doesn’t look Hawaiish), and she has endless conversations with Cooper and the militant Hawaiians about Hawaiian mystical folklore that sounds like gibberish and is never explained. Cooper’s ex-girlfriend (Rachel McAdams) is also at the base, and she is married to a guy who barely speaks and instead communicates with looks and gestures. McAdams is whining to Cooper about how he was the love of her life and didn’t pay her enough attention. Stone is anti-weaponry (which is weird since she’s a fighter pilot for the U.S. Air Force–hellooooooo . . . .?). And she gets all upset when she learns that the billionaire for whom Cooper is working wants to launch nuclear weapons into space with his satellite, making him unaccountable to anyone. So, Cooper destroys the satellite after launch to win Stone’s heart. Then, Cooper finds out McAdams’ daughter is his child. The End. Oh, and did I mention that fat Alec Baldwin plays an angry Air Force commander and that another Air Force officer does weird things with his fingers? Sound like a great movie to you? Me neither. And I sat through this Gitmo-torture-worthy crap. This was clearly nothing more than a paycheck for every actor involved. “Aloha” is a low blah. 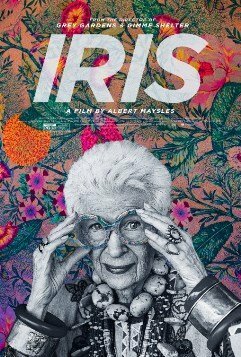 * “Iris“: This is by far one of the most enjoyable, light, entertaining documentaries I’ve seen in a long time. And it’s not about anything serious or important. Just the opposite, in fact. But, still, I was thoroughly enthralled and amused by it. It’s about the life of Iris Apfel, a 93-year-old Jewish lady from New York City, who has become something of a fashion icon and entrepreneur very late in life. Her husband, Carl Apfel, turns 100 during the movie, and the filmmaker/director, Albert Maysles, died in March of this year at age 88. If you’ve ever read any fashion magazines or human interest articles in any of the major newspapers you’ve probably seen or heard of Iris, the woman with the giant, round black glasses and outrageously loud and massive costume jewelry. My late Grandma Marilyn used to use the yiddish term for this kind of dressing up: “fah-putzed.” The movie begins showing Iris putting on layers and layers of loud, chunky jewelry and clothes, and we soon learn that she has one of the largest and most expensive collections of costume jewelry in the world. She also has a giant collection of collectible chachkes and knickknacks in her two fancy New York apartments and her Palm Beach condo. That even includes a Christmas train display (she and Carl are Jewish, though that isn’t mentioned in the film). Iris’ collection is so different and so well known that it became an exhibit at the New York Metropolitan Museum of Art’s Costume Institute’s annual charity fundraiser. As a result, her renown took off, with write-ups by all the top fashion publications and newspapers of record. The buzz made her a star in the fashion world, and soon, she was consulted by major fashion designers and buzzed about by celebrities (the movie shows Kanye West telling her how much he admires her). Because of all this, Iris started her own jewelry and shoe line, which quickly sold out on HSN. Watching this, you wonder how Iris got all this money to buy all these expensive designer clothes and costume jewels to pile on and store in three residences. And that’s, frankly, the more interesting part of the movie, as dazzling as the eye candy of her jewels and fashions. Iris built a career as an interior decorator, beginning in the 1950s. In the ’60s, she began working with the first of eight Presidents, including Reagan, in helping to decorate the White House. Her husband mentions that Jackie Kennedy didn’t like them because there was “that incident,” but this is a tease because they don’t tell you the story (Iris admonishes her husband to keep quiet about it). I really do wanna know that story. But Iris was more than an interior decorator. She was an entrepreneur. When she began her career in interior design, Iris wanted fabrics that didn’t exist. So, she went to various weavers and loomers and contracted them to create fabrics using the designs she created. The fabrics were so in demand that she and her husband partnered with one of the weavers to create a company, Old World Weavers, a textile firm that created her unusual designs, most of them classics in the style of old world Europe. Because of the fabrics, she was invited to restore and decorate state Houses of Representatives and the White House, as well as lots of private, wealthy residences. It’s really a great story of American talent, ingenuity, and capitalism. Above all, Iris’ message–and we should all take it to heart–is individualism. Don’t be a follower. Make your own style. And Iris, although a New York socialite and likely a part of the New York social left, is not a liberal when it comes to feminists and children. She declares in the film that she decided early on not to have children because she wanted a career. She frankly states, “Women cannot have it all,” and adds that if she wanted both a career and children, one would suffer–the career or the kids. She says she didn’t want to have children who were raised by a nanny. I liked that she is open about this and doesn’t buy into the fantasy that you can have it all as a career women. You can’t. Although it’s only an hour and 20 minutes, I felt the movie was a little repetitive toward the end, but that was a minor thing. Overall, I really enjoyed watching this. It’s not just eye candy for women interested in fashion, although I do love that stuff. It’s also funny and amusing, as Iris is so over the top and is in on the joke. She enjoys all the ridiculous hype over her. And how hype has turned this ancient Jewish lady into a fashion icon (who was never a model or a fashion designer before) is part of the statement of this movie. I believe men will find this almost as enjoyable as the women (or gay boyfriends) they take to see it. Or at least, they will definitely find it hilarious and fun to watch. Despite her wealth, Iris shows that you can find her over-the-top style of jewelry at very affordable prices on the streets and shops of Harlem and little flea markets in your neck of the woods. Still, the movie is an interesting, relaxing look at how the beautiful–and not so beautiful, but very rich–live. 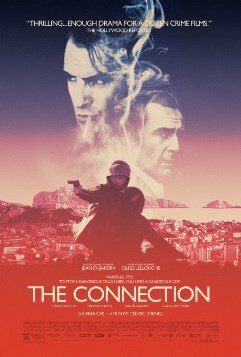 * “The Connection [La French]“: This French-language film with English subtitles shows us the French side of “The French Connection,” the drug ring that smuggled dope into America in the early ’70s. The mob is run by an Italian Frenchman, Gaetan “Tany” Zampa. But the movie’s focus is on the man who fearlessly prosecutes him, French magistrate Pierre Michel (Jean Dujardin). While this is a very courageous story and features clear right versus clear wrong, I felt the movie was predictable and something I’d seen a million times before. I know the filmmakers can’t help that: this is a true story, and it depicts what happened. Still, I felt like the movie came about 30 years too late, as we’ve seen so many of these movies already. That said, the acting is very good and makes it entertaining and enjoyable. It’s definitely not boring. And I liked seeing the 1970s-style fashion, cars, and sets. It’s not a bad movie, just not much new in it. i gotta see this iris movie… love stories about the quirky, eccentric types. debbie’s description of iris in her review remind me of my late aunt rose who was a sweet lady but a very unique person and a firecracker. We don’t plan to see any of these new movies. We went to movies the other day for the first time in 10 years. A neighbor treated us to see the new “Avengers” movie. I really did not want to go as I thought I would be disappointed. We I was really disappointed. PURE TRASH. I wasted 2 hours of my life. I could not wait until it was over. America’s values have gone downhill. I actually heard people in the audience laughing at the one liners the so called “Avengers” said after they destroyed something. Give me the older movies on Turner Classic Movies anytime. It’s a shame our youth are being brought up and brainwashed by these newer movies. Accident or is this planned? 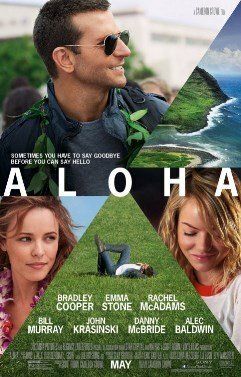 What stinks about “Aloha” is that I really like Bradley Cooper, really like Emma Stone and probably have a crush on Rachel McAdams, and the movie is such a turkey. San andreas is completely action packed. Dwyane jhonsson’s work is refreshing as always. Rock is the best. Debbie, just saw “San Andreas” which I thought was horrendous. I’m surprised you failed to mention the “color blind casting” Dwayne Johnson is half black/half Samoan, the wife (Carla Guigino) has olive skin, yet their daughter is pure white with big blue eyes. Really? In addition when the strip mall was being looted and trucks were being filled with electronics there was not a black looter in sight. Gee, Hollywood what gives? My cousins in LA are laughing at San Andreas – mostly because, according to them, everyone in LA loves movies in which LA is squashed. Volcano was a long inside joke, and at the showing my cousins attended, the audience was cheering for the volcano. Harmless silliness, I guess. In the movie review for Aloha, why no mention of the Hawaii Sovereignty movement?